Guest article by Wim VAN UTRECHT, a companion piece following his examination of Light Pillars and their possible role in the Cash-Landrum UFO case. Commentators on several lists have raised a couple of pertinent questions about my suggestion that a light pillar caused by a combustion flame was – at least partially – responsible for the CASH-LANDRUM incident. This is an attempt to respond to these posts. How bright are light pillars in high cloud? In one of the best cases on record, a trained observer, studying a reflection from the glow of a blast furnace converter through a telescope, reported that it looked as if the flames from the furnace mouth could actually be seen moving about inside the reflected image [SPERRA, William E., "A Night Mirage" in Popular Astronomy, Vol. XVI, No. 3, March 1908, pp. 164-167.]. Using data obtained from another witness to the North Sea incident, Erik HØG of the Niels Bohr Institute for Astronomy, Physics and Geophysics department of the Niels Bohr Institute for Astronomy at Copenhagen University, found that the magnitude of the circular reflection observed that night was close to -9 [HØG, Erik, various Internet messages from November 1993 and May 1995.]. By way of comparison: the magnitude of the full moon is -13, that of a bright star -1. Normally, the reflected images are much weaker. Actually most photographs of light pillars that are on my website gallery (http://www.caelestia.be/lightpillars2.html) are time exposures (exposure time, aperture and ISO are mentioned for most images). Normally light pillars from combustion flames are not that bright, but the strange thing is that how longer you look at them the brighter they seem to get, up to such a point even that it’s easy to make yourself believe that the sky is splitting in two and that you’re looking at a fissure in the sky with a fire behind it. Have there every been similar incidents? When I first read about DEVEREUX’ experience, I wondered if this pulsing, orange vertical shape could not have been a mirrored image of a flare. Possible candidates were flares at the Beckton Gas Works or the Shell Haven Refinery, but these were not in the NW but in the NNE and NE. A fire was another option. In an attempt to get to the bottom of this, I sent DEVEREUX a letter asking to indicate the exact line of sight on a map. He never responded. A group of joyriding youths consisting of the driver, 25 year-old Geoffrey Maskey, and his passengers, Mavis Fordyce and Michael Johnson had decided to pull over on the curb near a tree lined Walton Avenue. The youngsters were engaged in lively conversation when Johnson abruptly opened the car door and walked out into the murky night. Just moments after, the youths began to overhear a “high-pitched humming” sound. Fordyce grew anxious as the disconcerting sound began overwhelming them and Maskey leaned out the window to try and ascertain the origin of the annoying noise. The youths spied an oval-shaped, orange object suspended in the sky over 90-feet above his car; and it was glowing so brightly that it bathed the surrounding countryside in its eerie orange glow. The apprehensive duo — both of whom were reticent to leave the car and wander into the forest wherein the UFO and their friend were lurking — began shouting their Johnson’s name to no avail. Johnson then suddenly emerged from the wooded area. He staggered into the road with a dazed expression adorning his face. Maskey hoped that he was just having a go at them, but as soon as Johnson collapsed in the middle of the street he knew that this was no laughing matter. Fordyce and Maskey wasted time in exiting the vehicle to their friend’s aid even though they were frightened and in shock. They found Johnson laying motionless on the asphalt, totally unconscious. Fordyce and Johnson with the friend they rescued sped away from the forbidding forest and the strange orange light toward the nearby Felixstowe hospital. Once at the hospital Johnson regained consciousness, but he was suffering from amnesia and could not recognize the friends who had rescued him, much to their dismay. The doctors on duty diagnosed Johnson as having succumbed to a serious shock. Johnson also sustained physical trauma from the UFO encounter. Doctors noted that he had unusual burn marks on the back of his neck and a contusion above his right ear. The alarmed doctors decided to transfer Johnston to a better equipped hospital. The doctors then decided that it would be prudent to transfer Johnson to the hospital of Ipswich, which was far better equipped to deal with Johnson’s injuries and psychological condition. The following day Johnson recovered his senses and when his friends came to visit them he told them of his harrowing encounter with an ostensibly alien entity in the woods. Johnson claimed that when he abruptly got out of the car the night before he was compelled to do so by an unknown “force,” which insisted that he go into the woods. The odd creature was engulfed by orange flames. It was at that point that he blacked out. I added this anecdote to my catalogue because it was suggested at the time that the youngsters had taken a flare from the nearby Propane Gas Plant at Felixstowe for a UFO. I have no idea if that theory was based on any investigation. Description: (1) intense light lighting up the entire sky; all houses in the surrounding streets seemed to be engulfed in flames; in the sky there was a reddish cylinder which resembled melted steel; seemed to be falling from the sky; (2) like the sun in the morning, but with fusion going on in the centre; (3) blinding light. Duration not given, but at least several minutes. Here too, no sign of any investigative report worthy of that name. The problem is that these extreme cases are to be regarded as pure anecdotes and that, as far as I know, no attempts were ever made to document the experiences in a scientific way. So probably we will never know if light pillars were involved or not. I could cite dozens of examples of vertical “cigars” and “cylinders” that were successfully identified as light pillars from flares, but the majority of these are less spectacular. Often the veracity of the purported side effects seems to depend on who spotted the lights and who investigated the sightings. 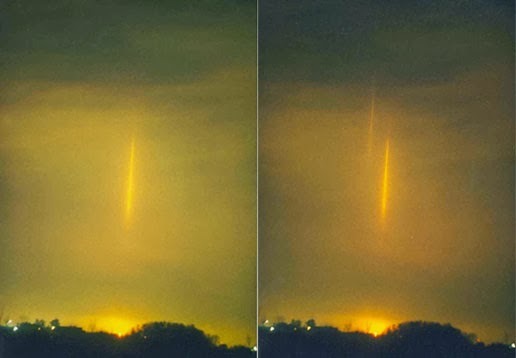 The fact that the CASH-LANDRUMS were able to see the “vertical light” in the rear mirror when driving east to Dayton rules out oil refineries south of Houston as the cause of a light pillar. What we need is a big flame much closer to where the CASH-LANDRUMs left the Huffman-New Caney road and took the turn towards Dayton. Historical Google Earth maps show that there was (and still is) a chemical plant near Sheldon Road, Channelview, Texas. It is now called LyondellBasell Industries (formerly Lyondell Chemical Company and before that Lyondell-Citgo). The new plant was established in 1985 from facilities belonging to the Atlantic Richfield Company (ARCO Chemical). This site is a good candidate I think. It is exactly in the continuation of the stretch of the Huffman-New Caney Road where the bigger part of the incident took place. It is also not too far south. A reflection in the sky of a flare at this location would have been visible in the back of the witnesses when they were heading East to Dayton. The plant is 34.4 km (21.4 miles) south from where the fiery streak was first spotted. 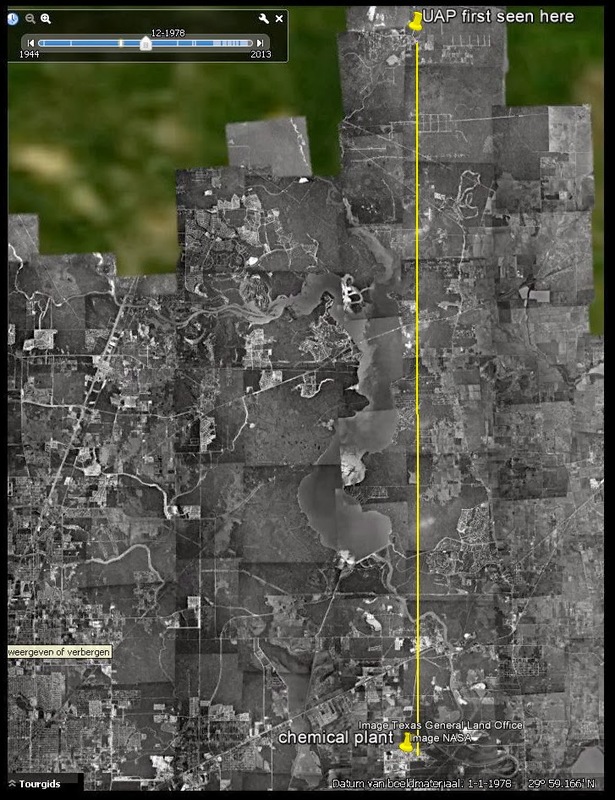 1978 Houston area satellite photo with the UAP and chemical plant locations. Note: a light pillar of a big flame 21.4 miles further down the road reflecting in 13,000 to 16,000 ft high cirrus (the average altitude for this type of optical phenomenon to occur) would have been visible at an elevation of roughly 13 degrees (centre of the reflection). An (valid) objection to the Light Pillar Theory is that the sighting set off with “a light” that came from the left over the tree tops. In his recent December 4 interview at podcastufo.com, Colby repeated this. But on page 4 of SCHUESSLER’s book, which was the main source for my draft article, there is no mention of an object coming from the left. Just a “glow on the horizon” and “a vertical streak of red” that “appeared to be miles away” and “appeared to be getting larger”. “Suddenly they observed a large light above the pine trees some distance ahead. Although the light was extremely bright, they dismissed it as an airplane en route to Houston Intercontinental Airport and continued to drive back to Dayton. When they rounded a curve and entered a long straight stretch of highway FM 1485, they again saw the bright light. At this time it approached the road and seemed to float down into the opening between the trees lining each side of the highway”. If the witnesses themselves dismissed the light they spotted in the East as an airplane, I see no reason to contradict this. It may well be that this light - shape and colour are not mentioned - was unconnected to the fiery streak that came into sight as the car rounded the curve. As for the object coming to a stop in the middle of the road, a very simple illusion can explain this: as Betty turned right on the road, the trees on the left will have glided past the car from right to left, making it look as if a distant stationary object sailed over the trees in the opposite direction. In other words it will have looked as if the fiery streak came from the left and settled above the road. So the movement of a plane en route for Houston, and the illusion of a light pillar gliding over the trees in the same direction, could easily have created the impression that the two were one and the same object. The important thing at this stage is that the flame-coloured vertical streak appeared stationary from the moment the witnesses were on the straight stretch of the FM 1485 that runs south. Were the weather conditions favourable for light pillars to appear? Thanks to Tim PRINTY we now have the weather data for three places bordering the sighting location. One important piece of information is missing though: the type of clouds and their altitude. A low cloud cover may not be ideal for light pillars to appear because it would prevent the light from the flame to reach the ice-crystal clouds higher up (the clouds in which light pillars appear are usually high-altitude cirriform clouds). So if there were low clouds, a reflection could only have been visible through gaps in the cloud. Fragment of 12/29/1980 area weather data supplied by Tim Printy. The weather situation on the ground can be very different from one light pillar observation to another. What we really need is data from a weather balloon. Tim and I tried to get these through http://weather.uwyo.edu/upperair/naconf.html, but only to found that there are no soundings available for Fort Worth, Shreveport or Corpus Christi. The closest meteorological stations that did publish soundings for December 29th are Lake Charles (112 miles E of Huffman) and Little Rock (379 miles NNE of Huffman). That's all quite far away. Moreover, these balloons were launched at 18h00 local time, i.e. almost three hours before the sighting occurred. But our search may not have been totally in vain: a quick look at the data from Lake Charles tells us there was a rather strong temperature inversion in the lower regions of the atmosphere (with temperatures rising with 5.6 deg Celsius between 10 metres and 55 metres and another 5.8 deg between 55 m and 887 m). Inversions are not required for light pillars to occur, but they may be instrumental in spreading the falling ice-crystals into a flat horizontal layer, much like a giant mirror. An inversion layer may also explain why the witnesses could hear noises of flaring activities many miles distant (inversion layers refract sound to the ground and the long road bordered by trees may have acted as a large tunnel directing the noise to the witnesses). The “deafening roar” and “intermittent beeps” reported by Betty and Vickie are the typical sounds that can be heard when flaring takes place. There’s one problem though: according to the weather data from Houston, Galveston and Beaumont, the wind was blowing from the N to NW during the evening (wind speed was around 10 miles/h, i.e. moderate). Normally, a northern wind would have carried the sound away from the witnesses, unless – and this is clutching at straws a bit – there was a localized inversion around Lake Houston encompassing the chemical plant and the Huffman-New Caney Road but not the surrounding areas. It is known that the air beneath an inversion layer may be completely cut off from the air circulation of the weather system moving through the region, creating a “lake” of stagnant air. But we need a meteorologist to tell us if the weather situation on December 29 could have created such an situation or not. How can an optical phenomenon account for the medical traumas suffered by the witnesses? Obviously it can’t. But perhaps air pollutants from flaring operations can. After I sent him a copy of my draft article - that was in 2009 -, veteran researcher Matthew GRAEBER called my attention to Brad SPARKS’ analysis of this aspect of the CASH-LANDRUM incident, An Analysis of the Cash-Landrum Symptomatology. Brad - and APRO consultant Dr. Richard NIEMTZOW agreed with him on this - concluded that there were sufficient indications to accept that the symptoms suffered by the CASH-LANDRUMs could not be due to ionizing radiation. Instead, Brad’s findings showed that many elements of the case indicated that the witnesses had suffered a chemical agent exposure. Brad’s findings would be in line with Vickie’s recollection of a smell that reminded her of lighter fluid (but, if I remember well, this detail only surfaced under hypnosis so we might not want to take that too seriously). If there was a localized inversion over the lake that night, and the flare stack was below the inversion layer, we could speculate further that the inversion not only trapped the sound but also the poisonous gases from the flaring activities and perhaps even the heat emanating from the flame. On the other hand, we don’t want smoke to spread too far in the direction of the witnesses as that would have prevented the light from the flare to reflect in ice crystals suspended halfway the flare and the witnesses. So probably not a good idea. Anyone? By way of conclusion, I would say that the light pillar explanation is still an option, nothing more, nothing less. For the theory to be upgraded to the status of plausible explanation, we need more proof, like a confirmation that flaring was in effect taking place at the old ARCO Chemical site that evening. But it’s not clear to whom such a request should be addressed. And if we do find someone who has access to these 33 year old archives, it’s far from certain that he or she will be prepared to consult them for a request like this. During my own inquiries, now more than a decade ago, I learned that petrochemical companies are very reluctant to give this type of information. They automatically think that some kind of pollution problem is being investigated. And finally, I can’t help but compare the CASH-LANDRUM incident to a pseudo-religious experience. Belgium, which is where I live, has a long history of religious apparitions. In many of these instances, the events were triggered after the percipients had seen a luminous shape in the distance that looked unusual to them. 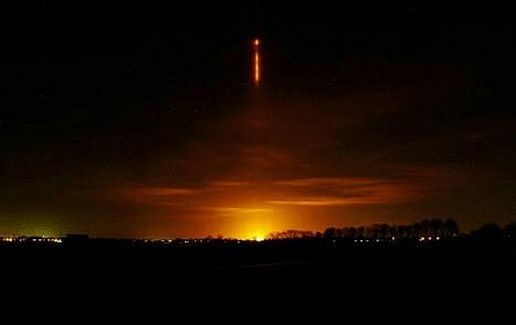 In a previous message I already pointed to the Dutch case of January 7, 2007, when a bright light pillar caused by a flare at a chemical plant in Terneuzen was interpreted by accidental observers as a sign of the second coming (see photo and caption pertaining to this incident at http://www.caelestia.be/OP-PH-21.html). It is not a coincidence, I think, that the CASH-LANDRUMs were “very biblical” and religious people. Perhaps their religious background helped transform a light pillar into a “chariot of fire” coming out of the sky. Experienced investigators of UFO reports know how a bright star or planet can trigger a spectacular UFO encounter. If astronomical bodies can create such grotesque misinterpretations, a much stranger light pillar will do the job too, certainly if it’s spotted on a lonely dark road together with a fleet of helicopters. Thank you Wim for, continuing to investigate and explain your findings.